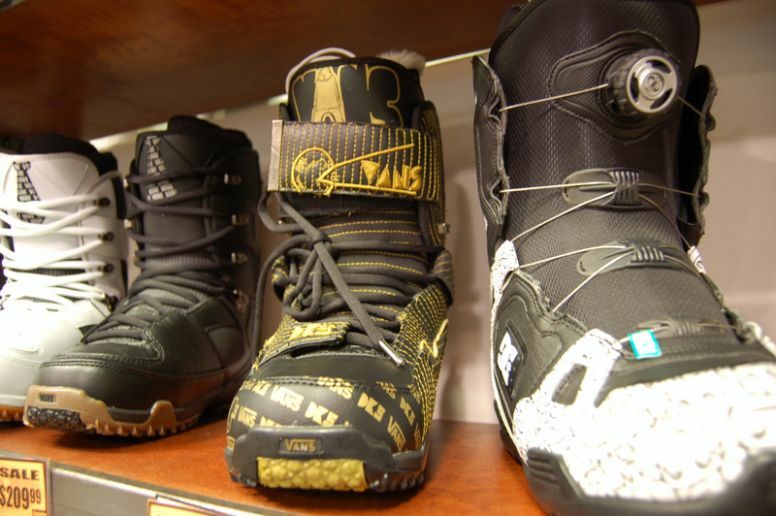 When choosing a new pair pair of snowboard boots there are a multitude of things to consider; cost, style, durability. Snowboard boots come with a stack of features that can be worth the extra money but sometimes it's important to focus on the basics. The first thing to consider is what style of riding you plan to do. Generally speaking, there are two main styles; freestyle and freeride. Freestyle is centered around park based activities like rails, boxes and jumps. If this is where you want to spend most of your time you want your boots to be light and somewhat on the soft side. Freeride boarding is concerned with just cruising around the slopes with the occasional trick to keep things interesting. When cruising around boots need to be comfortable but tight and firm to increase responsiveness. Weight is less of an issue because you'll be on the ground most of the time. A good fit is perhaps the most important thing. Too tight and your feet are going to start hating you, too loose and you'll start to notice your heals lifting which puts strain on your legs and makes turning harder. When trying on a pair of boots you want them to be nice and snug. Even if your toes touch the front of the boots, don't forget, your knees will be bent when you are riding which forces your feet back into the boots and your toes with them. Time will also have an impact on the snug fit, your boots will get looser and softer as they grow older. Don't be surprised if you walk away with a pair of boots one or two sizes smaller than your street shoes. Lacing methods vary considerably. Dial-tightened lacing can make lacing pretty painless but can be problematic if damaged. Velcro is used on some boots to aid tightening but straight boot lacing is still the most common method. There are however subtleties in the loops on the higher part of the boot. Some loops can lock the laces allowing you to let go and adjust your hands while finishing the lacing. This can make your life a whole lot easier and is surprisingly missing from a lot of boot designs. When deciding which boots to purchase, support and comfort are paramount. Some people like to stick to the same manufacturer as their board and bindings with the feeling that all components were designed to go together. Generally, this is not the case and if you've bought some Flow bindings and think you need Flow boots you should be cautious that you aren't being caught in a marketing ploy and that the boots you buy actually suit your foot type. The best idea is to try on as many pairs as possible, you will notice certain brands can be wider or narrower, firmer or softer. Keep going until you feel 100% comfortable because ultimately they will be seeing some serious action. So this is how it goes over time. Is it really so great being a multi-tasker and doing it all?